I’ve never used one so I am not sure. I don’t see why not? Just made this. It was delicious! My house was a little cool so it was a bit dense but still tasted great and made wonderful toast! Will let it rise a bit more next time but that will only be tomorrow! Highly recommended. Thank You! I am sitting here eating a piece that I just made this morning, YUMMY. This was such an easy recipe. Wanted to have some yummy breads around for the holiday and children coming home. This is perfect. No matter the recipe for this bread, mine never rises as much as the description says and always falls just a bit. What am I doing wrong here…? You may be letting it rise too much before putting it in the oven… or not enough… It’s hard to say. How do you get your dough to rise in a freezing cold day? that’s a great idea! be careful about the 200F though.. it’s a bit hot for rising. I have put things on my dryer while running, it gets warm. Hi. This recipe just popped up and I’m so looking forward to trying it. I’m English but living in the Middle East so muffins are stupidly expensive! Do you have the recipe in grams (or ounces) as I always seem to get different amounts if I use cups for measuring. I tried to do the recipes in grams and ounces for awhile but it took me SO long that I couldn’t afford to continue. Sorry. Do you think this would work with buckwheat flour for grain free? Aww Heather, thank you! You know you can always ALWAYS post pictures to the Restless Chipotle Facebook page. 🙂 I love to to see them. Will Do! My pictures aren’t as pretty as yours but it didn’t last long enough to matter! Lol Took a loaf to my Mama too that didn’t last very long either! Thank you for the wonderful recipe! Do you think a loaf would freeze well? Yes! It freezes very well! Good, Because I just made this this weekend and it is DELICIOUS!! Wow, If tastes just like an english muffin and so easy to make! i was just wondering if i would like to turn this recipe into a apple cinnamon or raisin cinnamon English muffin how much apple puree or dried fruit do you suggest adding? You could add about 1 cup of dried fruit but I don’t know about apple puree. I will try to remember to weigh the next time I make the bread, Tom. 🙂 It takes me MUCH longer to write a recipe that way, I’ve tried. Just took 2 loaves from the oven, and they look and smell heavenly! Can hardly wait to try some with a slather of butter and fig jam!! Thanks so much for this glorious recipe-I’m 60 years old and this is my first foray into bread baking. I can tell you it won’t be my last! ? Can you make this in a bread maker? I don’t think so, Valerie. I’ve used every kind of yeast. I even contacted the company that makes Red Star yeast. I know Surlatable stores sells it – in my area they do. They sent me a free sample of a yeast I’ve never seen. Platinum yeast. She even gave me a website where I can order. Heard so many rave revews. 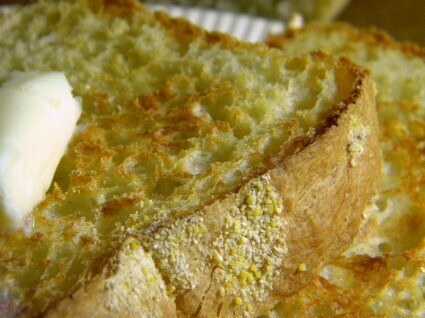 Wonder how easy this bread is to make? Thanks! This is one of the easiest breads to make ever. 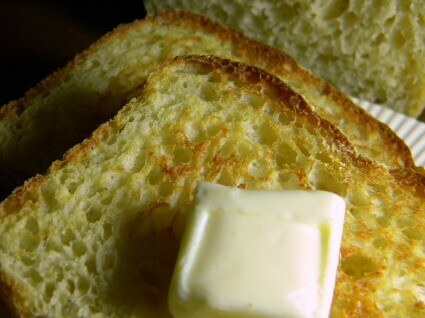 I usually suggest people start with this one or the buttermilk bread. Hi! I went to the grocery using the printed recipe which was asking for “dry yeast”…I bought Fleischman’s instant yeast quick rise…but then, back home, I read the text above the recipe and realized it needs ACTIVE dry yeast…will it work anyway??? Yes. 🙂 It will be fine. So tasty and so easy! Have you ever tried substituting some of the all purpose white flour with whole wheat? Yes! It works fine. A little more dense. Is 2% milk ok, or do you recommend whole? I use whole milk but 2% should be fine. 🙂 oh yes! So good that was! Do you make this in a standing mixer with paddle attachment? I have never made bread before, but I want to try this! Cheryl, I usually mix this one by hand. It’s easy! Question…..Save me the trouble of a failed batch, do you measure your flour straight from the container or do you loosen the flour and scoop into to measuring cup than level off? Sounds funny but both ways give completely different amounts of flour. One way packs the flour as it is measured and the second gives a fluffed measurement. Would be nice if everyone did it the same way. I cut the recipe in half and followed it to a T however my dough is absolutely dry. Not even close to goopy! What did I do wrong? I just stuck it in my oven on warm. I hope it works!!!!!! I just made this tonight (still rising/not in oven yet) but the full recipe, and I too ended up with really dry dough as well. Could not mix in anymore of the flour. Ended up having to kneed it and add handfuls of water to get it going again. Also triple checked everything as I was making it. Don’t know why I had so much trouble. :/ I’m sure it will still taste good though. That’s so strange… I’m sorry you had trouble – it’s either a difference in the flour or a difference in the measuring. I made a half batch too, and it was very dry. I just kept adding milk unil it got gloppy and it was fine. Only problem was that it was cold, so it didn’t rise as much, but it still had all the bubbles and holes. For how long should the dough be “beat”? Just until it’s all smooth… I’d say maybe 3 minutes or so? I’m with you on all the yummy craters for butter and jam and honey. This bread looks like a win any time. I’m printing it out for some weekend baking! Wow!